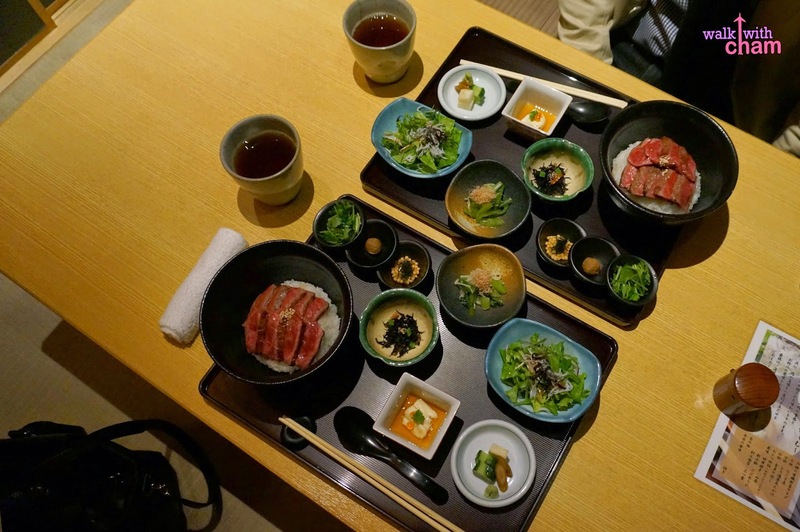 Japanese cuisine is said to be one of the world's great cuisines. Its uniqueness, taste, variety and diversity stood out from all other cuisines. Mike and I are big fans of Japanese cuisine even before we went to Japan. 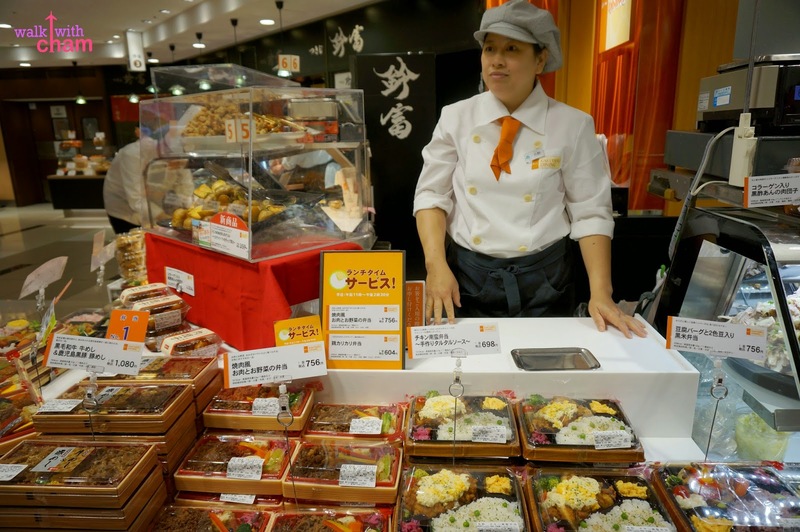 We have always been fascinated with their food and the thought of eating Japanese dishes in its actual country was kind of exciting. 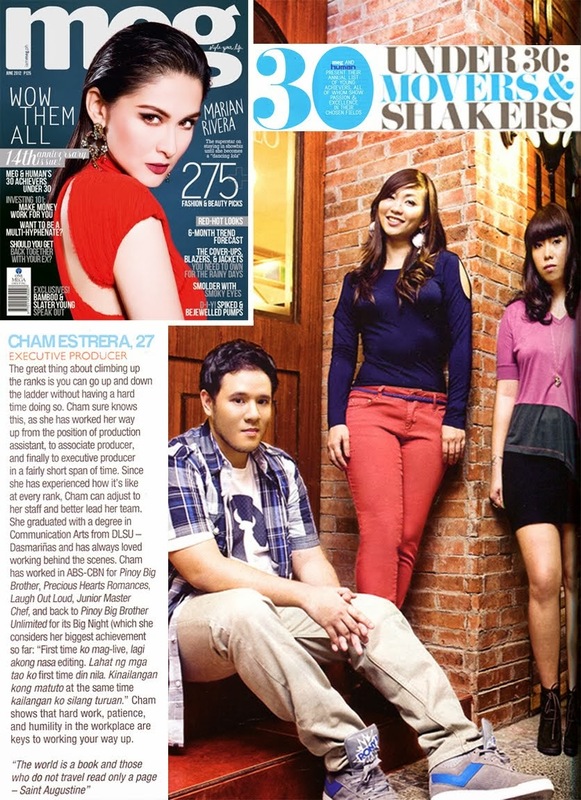 We've never really planned on what & where to eat, we just go and eat wherever our hearts, feet and stomachs tell us. Upon reading this post you will notice that we ALWAYS order Ramen and Gyoza as these are ChaMike's fave Japanese dishes. 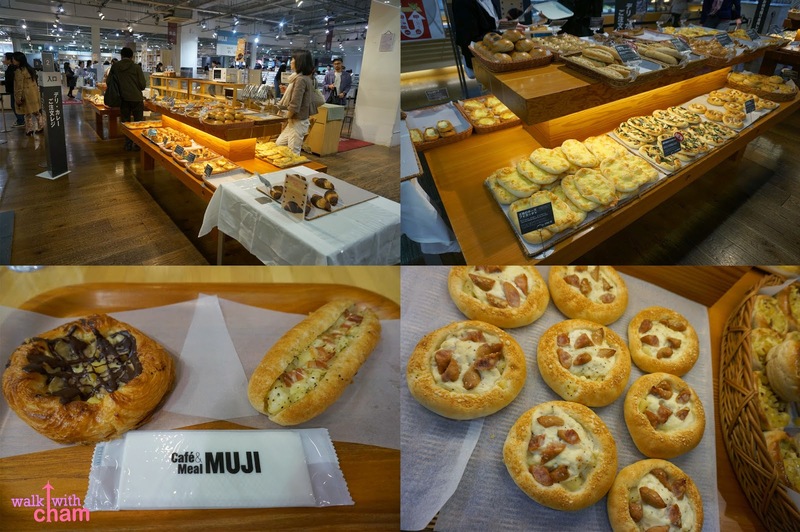 So here are the list of places and cuisines ChaMike tried in Japan. In Kyoto one of the many good places to get hungry was at the Kyoto Station because you will see the never ending choices of Japanese restaurants. 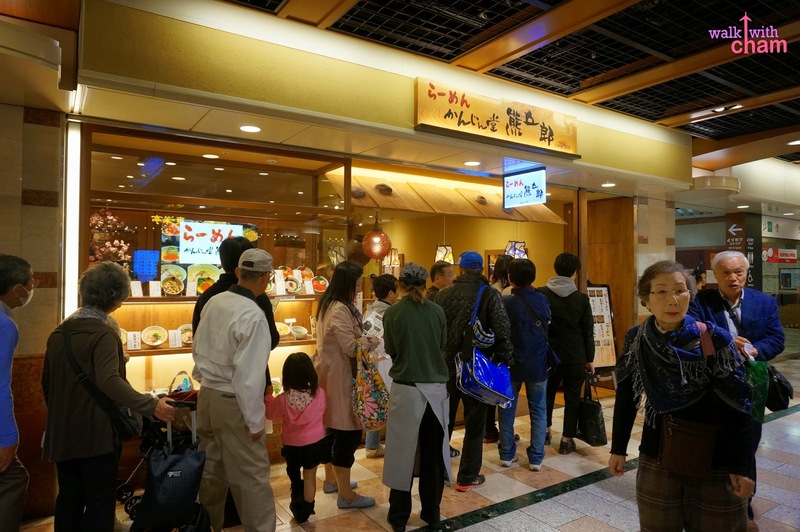 Among the restaurants, we chose Kanjindou for its set meals. 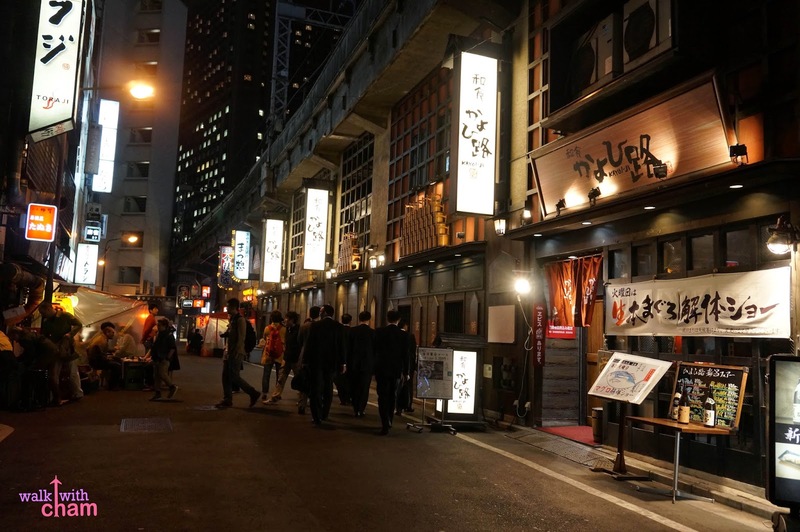 Along the Kawaramachi street you will see a row of Japanese restaurants that you can choose from, Mike and I tried dining at one of them (the one that offers English menu) after our Geisha hunting at Gion. 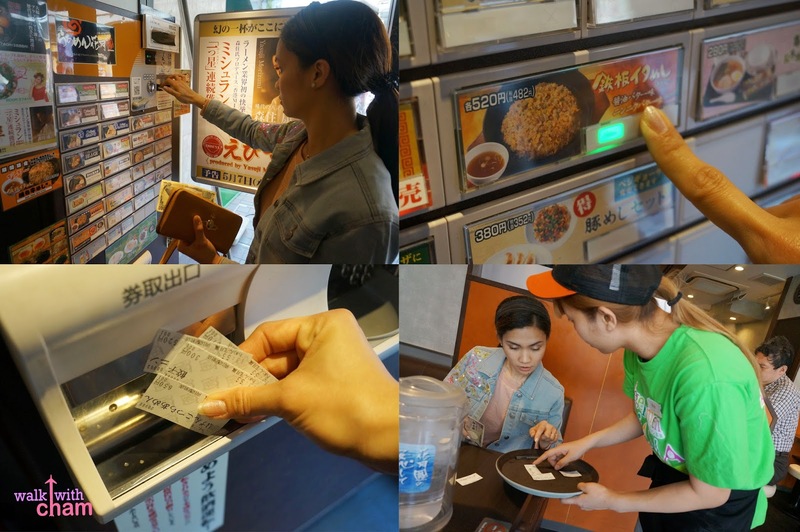 It was one of those nights where we got super kuripot because we didn't want to overspend on meals at our first day in Japan so here were our orders. I ordered Ramen in half for Y580 (P250) while Mike ordered gyoza for Y280 (P120) and gohan for Y380 (P164). 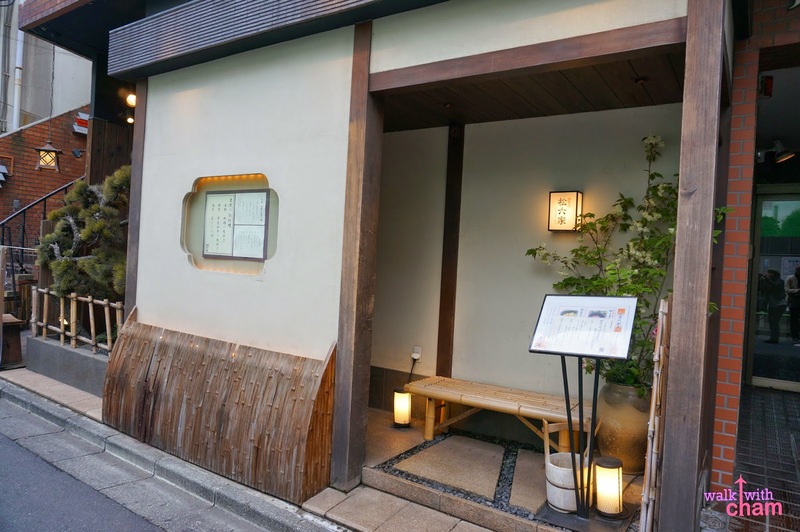 For our last night in Kyoto, Mike offered to treat me where ever I want (to celebrate his recovered back pack at Maruyama Park) and while walking along Sanjo-dori we stumbled upon this well-lit restaurant and checked their menu, the prices were a bit high but reasonable enough. Later on we discovered that this was the same restaurant where Mike's family had one of their dinners as well. 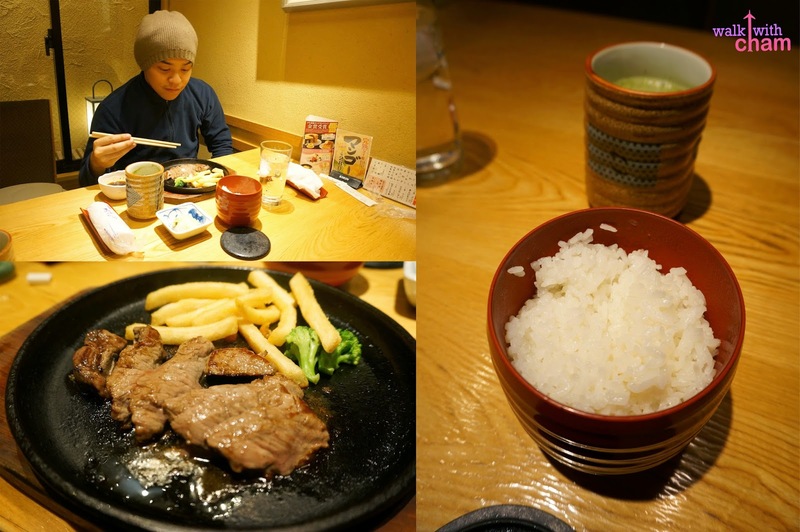 Mike ordered steak with fries and gohan as it was recommended to him by his brother for the excellent tasting fries. While I tried one of their bento offerings of seafood tempura, different types of sushi, miso soup and another soup which I mistook for a dessert which cost Y1,400+ (P603). 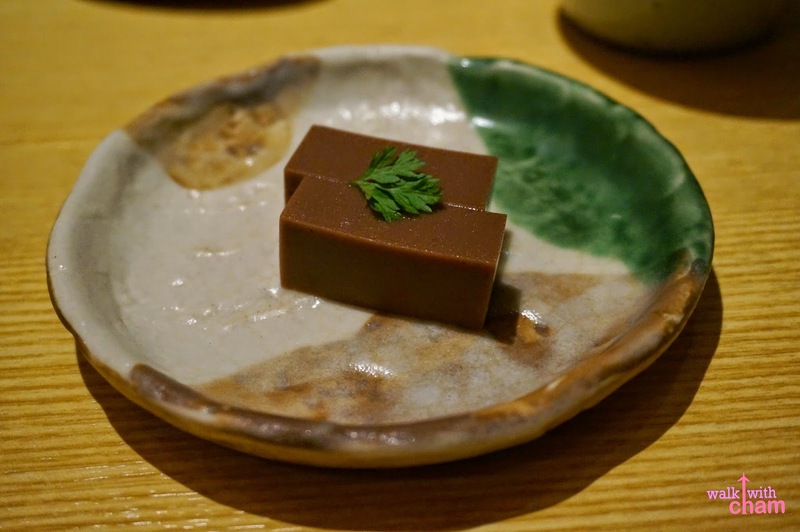 Ganko is known to serve great tasting sushi with rock-bottom prices. While paying we saw a familiar Japanese bread at the counter, it was the same bread Mike's family gave our family when they went to Japan. Love how it tasted so we bought some for pasalubong, it costs Y1,000 (P431). Miso Soup | a traditional Japanese soup consisting of a stock called into which softened miso paste is mixed. 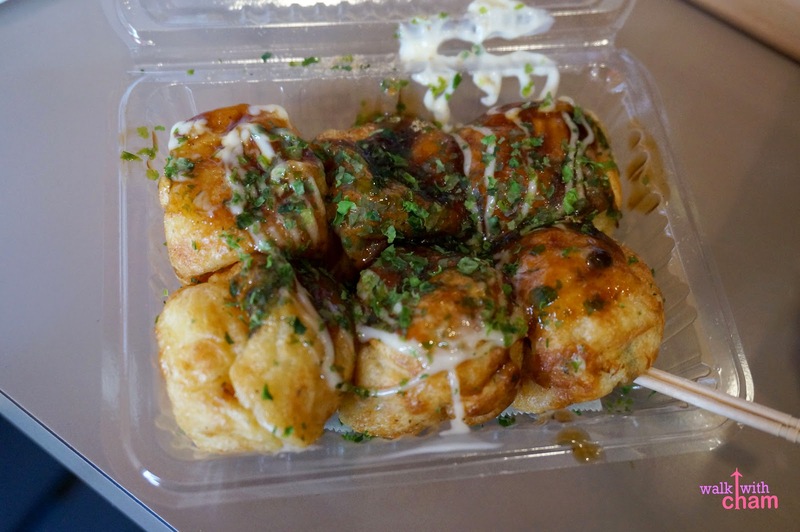 After all the walking at Nara Park, I became hungry and while going to Nara Station we saw a Takoyaki store. 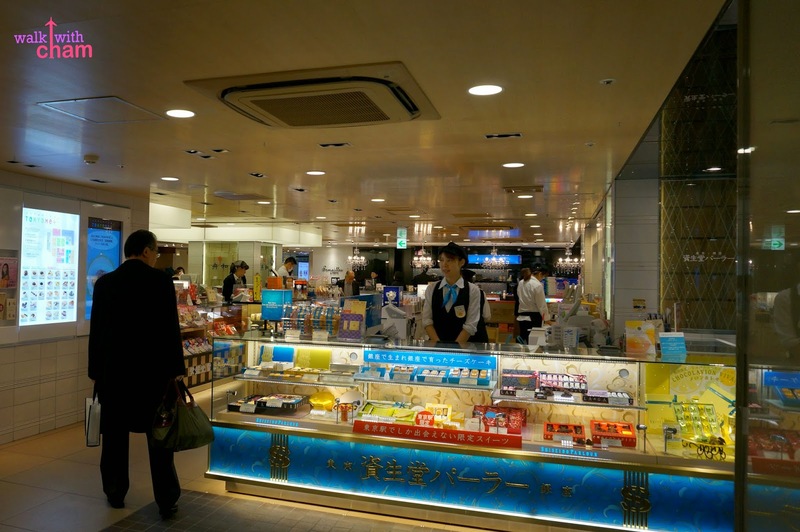 Another great place to eat with affordable prices and great selection of food is at the Tokyo Station Daimaru food court. 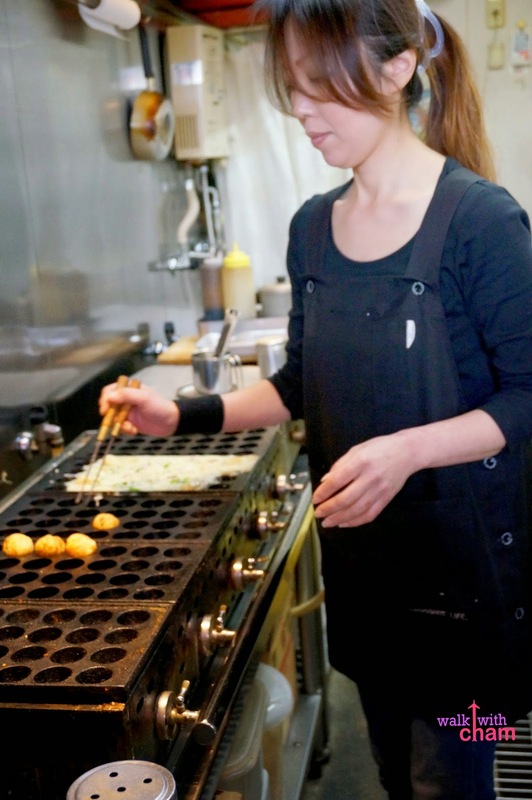 They offer different take out dishes perfect for commuters who are on the go. 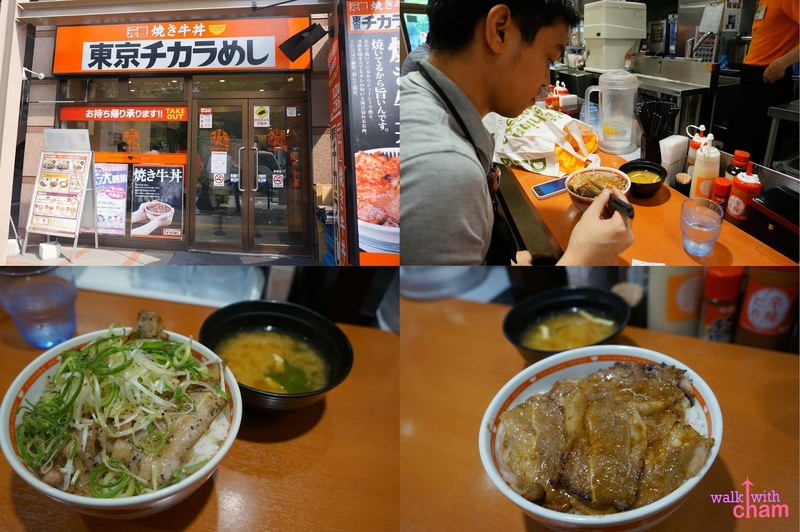 When we first laid our feet to Tokyo ChaMike were enormously hungry, so we checked their offering and I settled for a takeout of gyudon with gohan meal. Gyudon is a bowl of rice topped with beef. While Mike opted to order... any guesses? Gyoza!- bagong bago! hehehe! 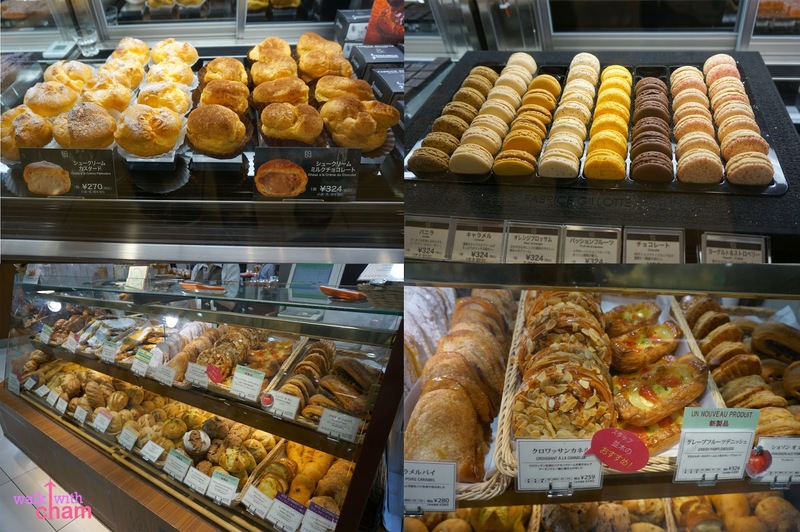 At the Daimaru food court you will also see a wide array of pastries, breads and sweets. These became our daily breakfast routine. Their bread were nicely baked and really yummy. Keep in mind that when you order here don't expect to have tables and chairs around so we either ate at the hotel or sit in a waiting area. I've always been a fan of Muji for their pens especially the erasable ones. 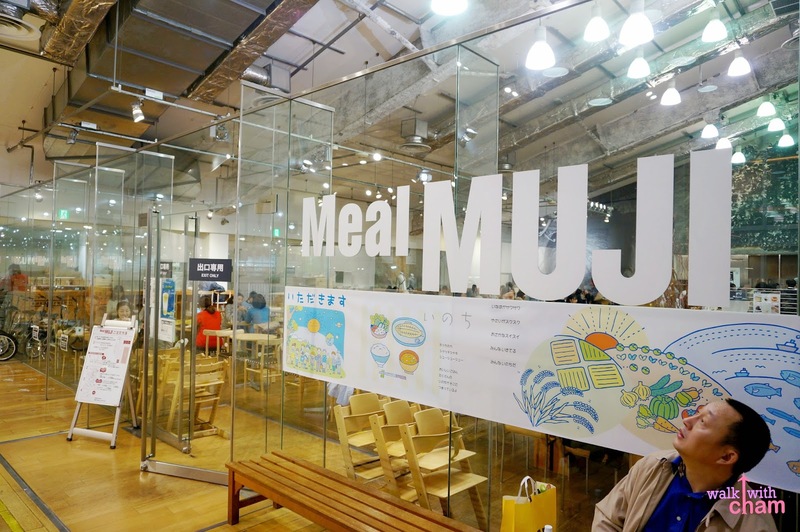 But it came a big surprise when I saw a Muji restaurant named Cafe & Meal Muji located at its flagship store in Yurakucho. Cafe & Meal Muji is a cafeteria type of restaurant that offers different types of bread, because this was something new to me, I convinced Mike to try out their bread. Take note that it is a self-service restaurant so after eating you have to return your trays and mind your trash. 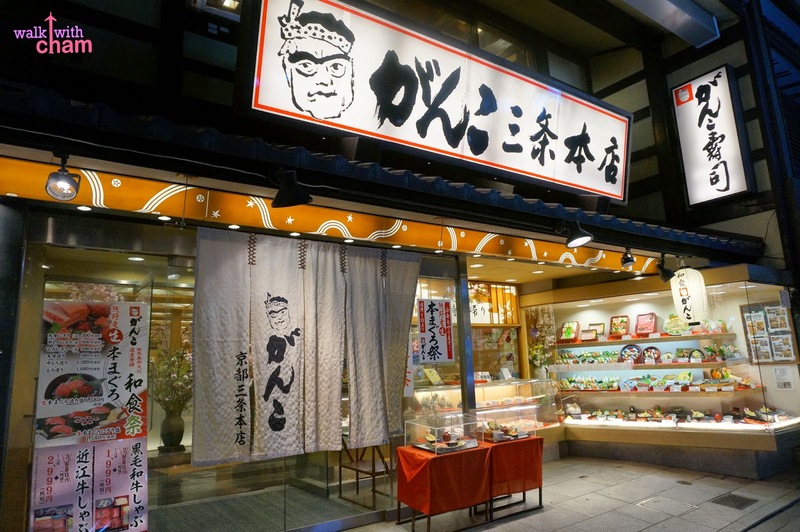 Another famous place to eat in Yurakucho is at the restaurants under the train tracks. 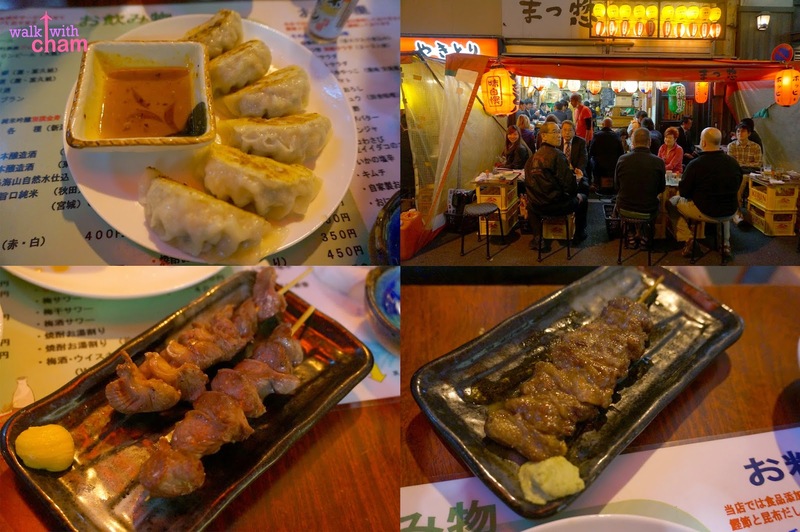 Many of the eateries are authentic izakaya, a casual drinking establishment that usually serves grilled food on sticks or yakitori. Mike and I decided that this was the perfect place to try sake, a Japanese alcohol made of fermented rice. There are two options of sake- hot and cold. Mike ordered one shot of hot while I ordered I shot of cold for Y400 (P173) per shot. 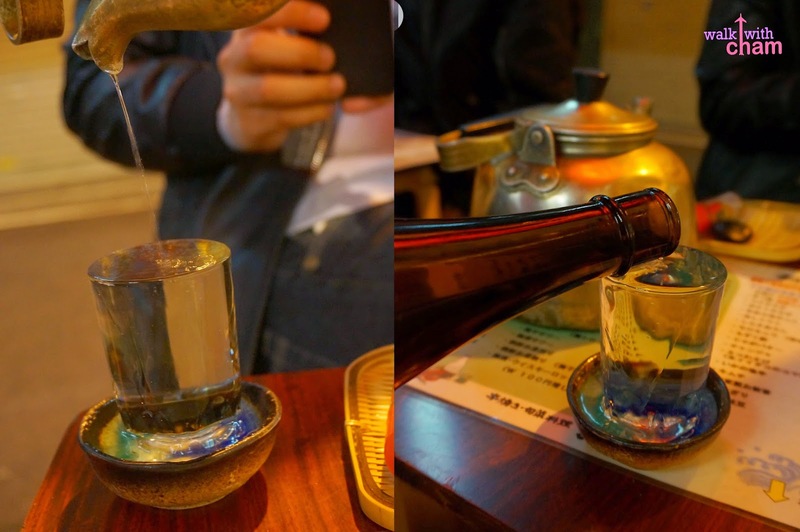 The sake is poured in a small glass until it overflows on a small saucer at the bottom. 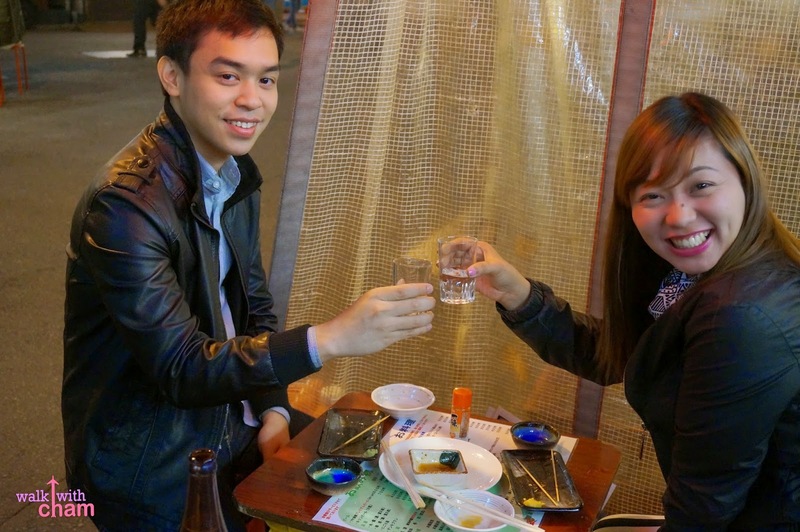 We didn't know at first that you should also drink the sake at the saucer until two locals beside us told so. 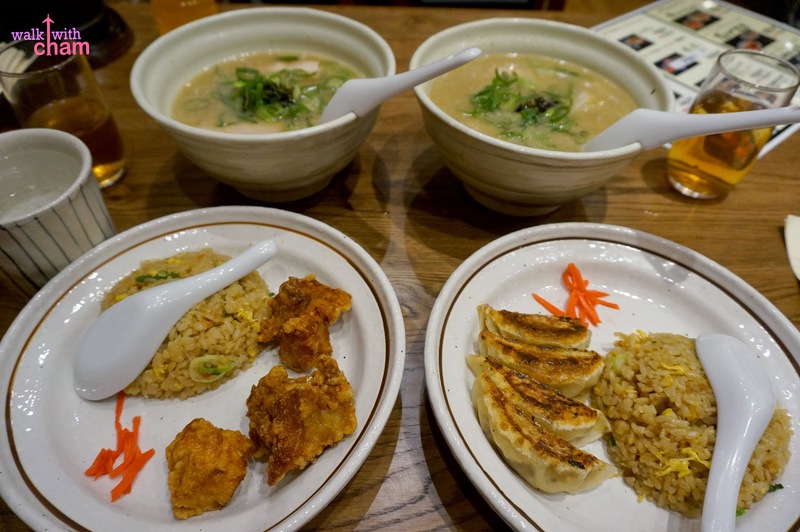 Aside from sake we also ordered eats perfect paired with alcohol. 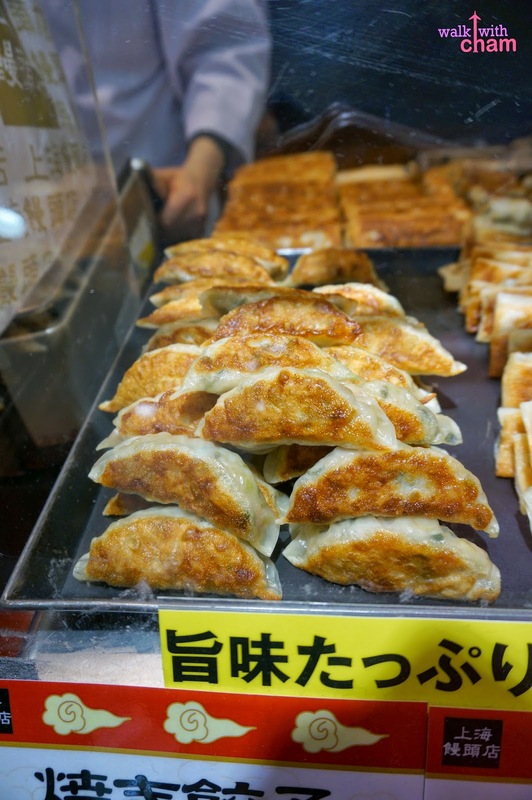 Gyoza (of course) for Y500 (P216), and 2 orders of Yakitori - Sunagimo (chicken gizzard) for Y350 (P151) & Wagyu (Japanese Beef) Y550 (P238). The wagyu was exceptional! The meat was tender & juicy. 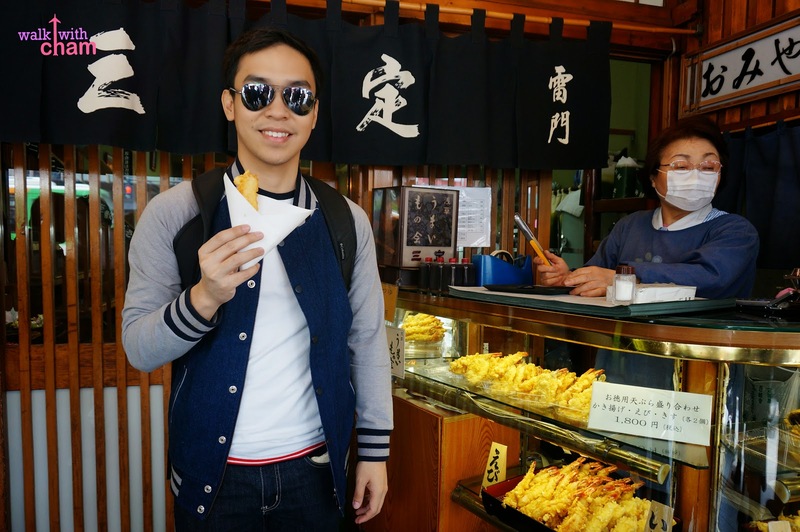 Another of Mike's fave Japanese dish is the ebi/shrimp tempura, a dish of seafood or vegetable that is battered and deep fried. 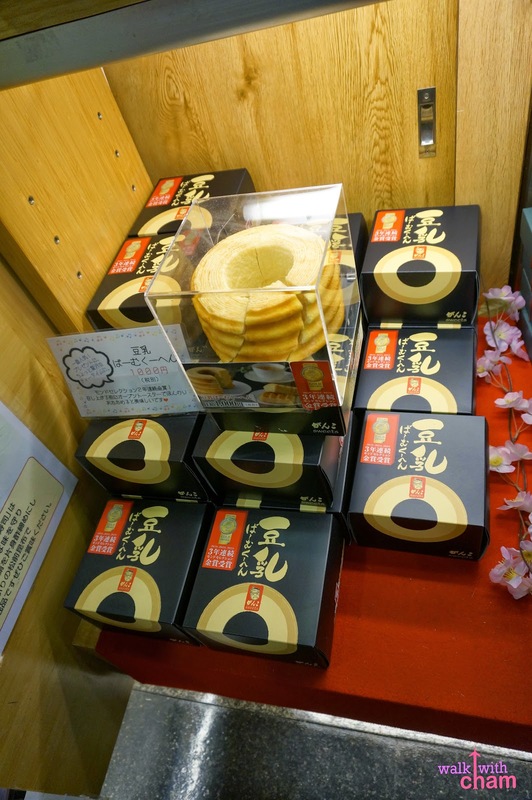 Mike tasted one of the best at Asakusa just outside the Kaminarimon gate after our trip to the Sensoji Temple. Mike ordered a piece of to-go tempura, when we asked for a sauce the lady handed us a salt but the taste didn't disappoint at all. 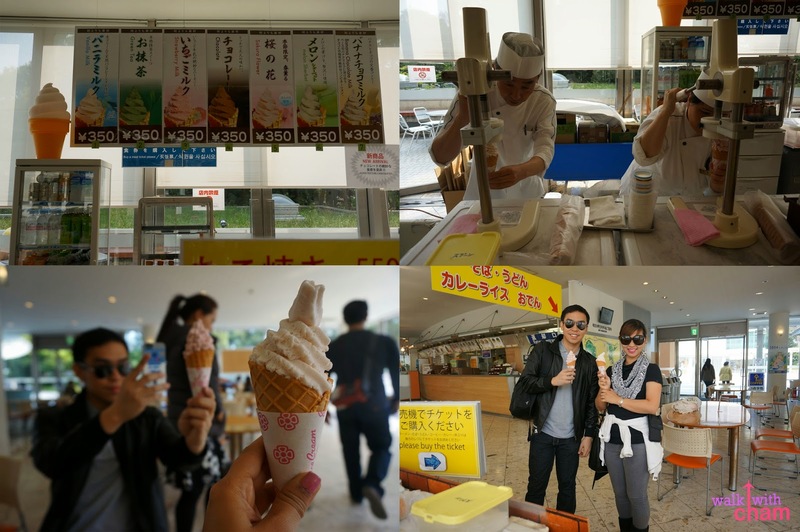 Mike and I had been seeing this soft serve ice cream almost everywhere but couldn't believe how expensive it was until we tried the vanilla flavor treated by my friend when we were at Asakusa we were blown away by the flavor and realized why it's costly. So while walking along the Meiji Temple Harajuku we became really thirsty and tired so Mike & I treated ourselves for an ice cream, Mike ordered the Strawberry flavor while I tried something new, the Cherry Blossom flavor. It tasted so refreshing that it excited my taste buds. 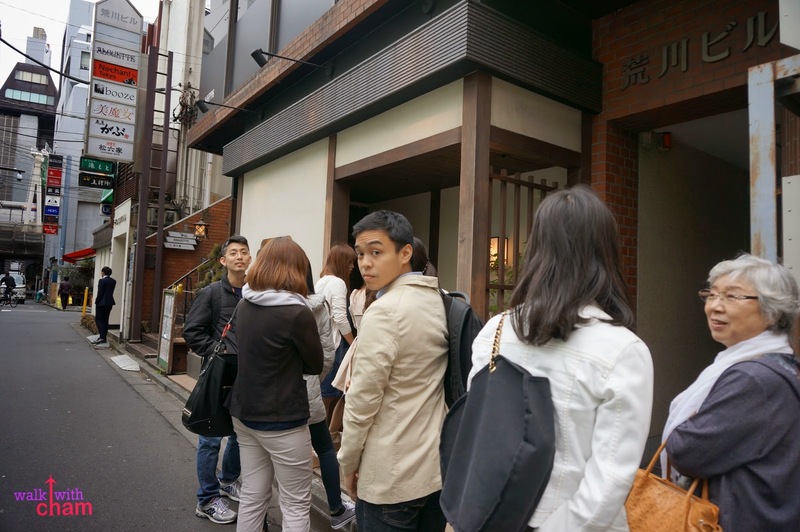 It's not just the food that stands out in Japan but the restaurants as well. 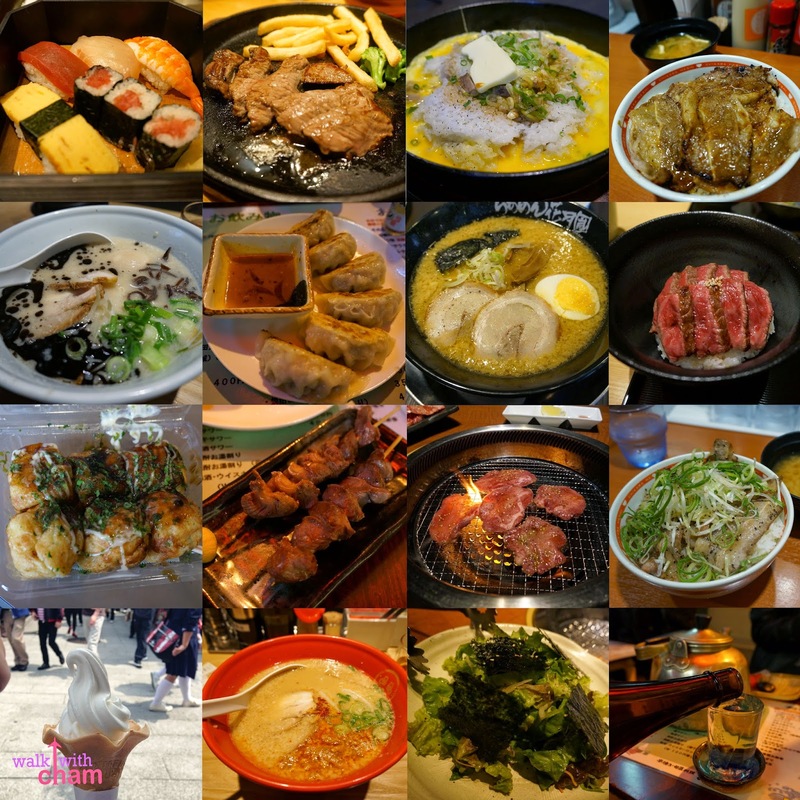 Japan is known for their unique vendo restaurants and here were some of the restaurants we tried with Japanese Vendo Machine. 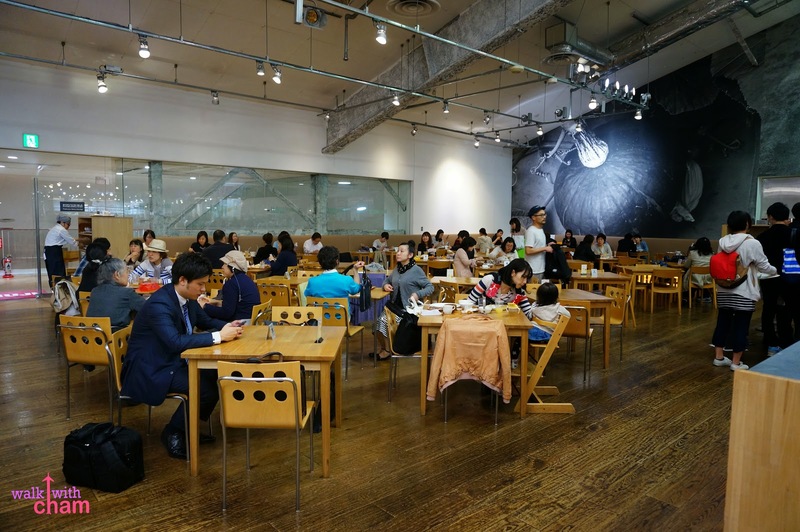 It was after our encounter with a sumo wrestler at Ryogoku when we realized we were famished and my friend, Twin recommended this restaurant for our lunch. Good thing Twin was there to teach us how to use the vending machine. 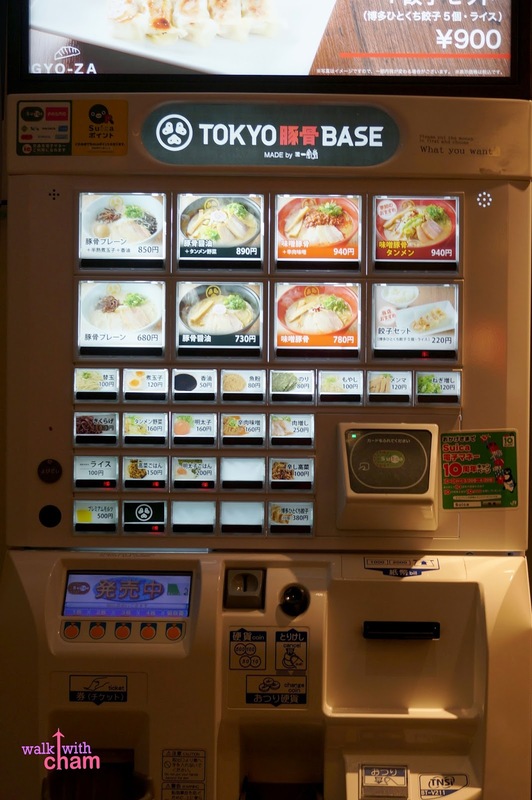 First you have to figure out what you want to order, then insert your money and press the button with the picture of the food you want, get the stubs and present it to the wait staff. Wait for your orders: Mike's order was [again] 5-peice Gyoza Y300 (P130) and Garlic Fried Rice Y520 (P224), Twin ordered Beef Fried Rice Y570 (P246) while I ordered (of course) Arashi Genkotsu Ramen Y650 (P280). It was lunch time at Harajuku when Mike and I decided to eat at a fast food chain around the area. 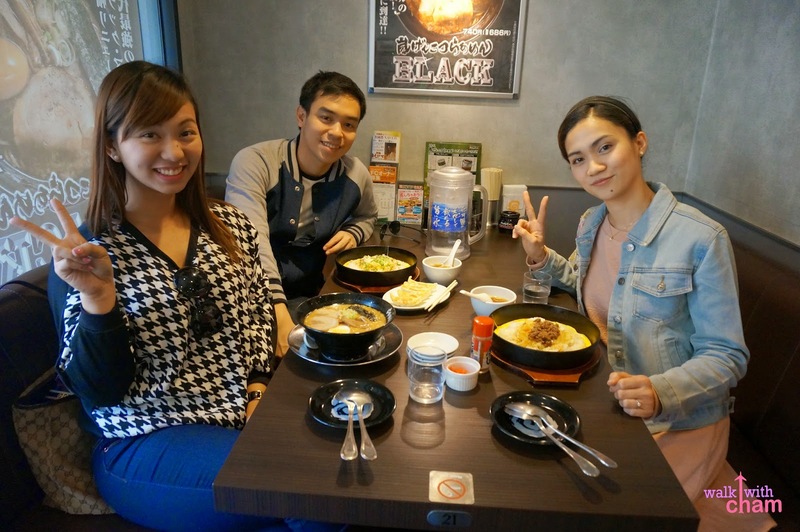 This time we didn't order gyoza or ramen but beef bowls which can be a great alternative to ramen. 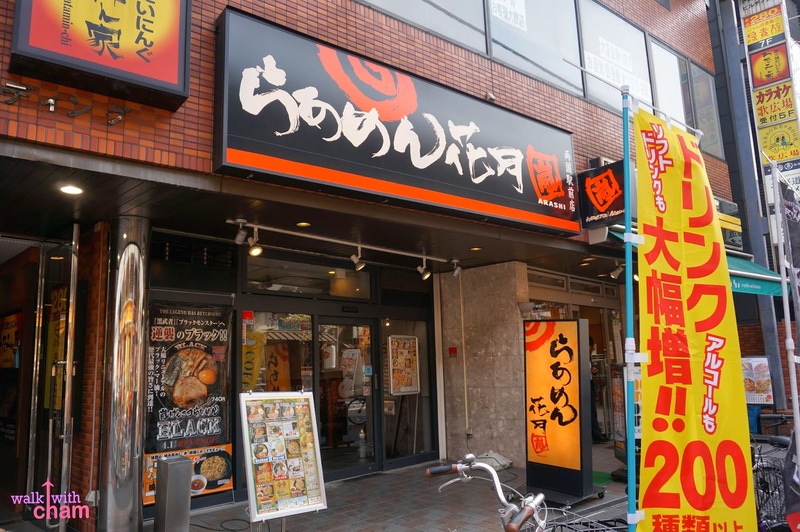 Tokyo Chikara Meshi has the same offering as Yoshinoya. 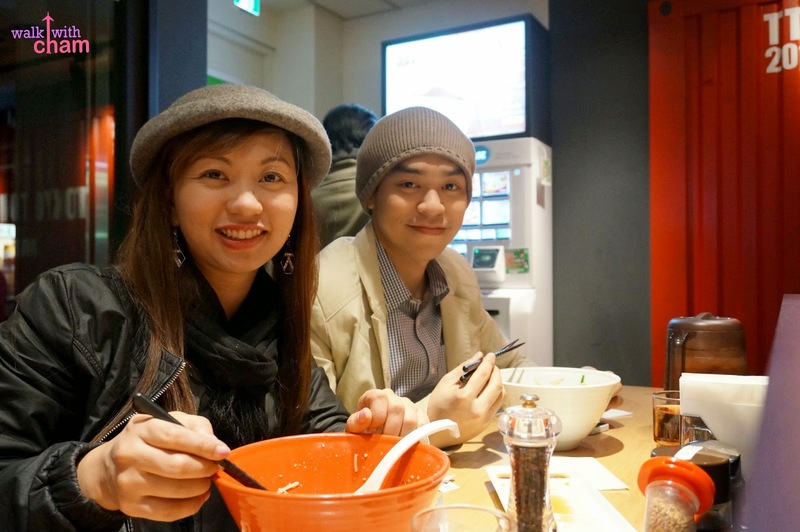 We both had gyudon but different kind, Mike ordered a grilled one and I ordered the one with black pepper and and spring onions both for Y450 (P194) each. Our orders came with a miso soup. A friend told us that when we go to Shibuya we have to eat here. 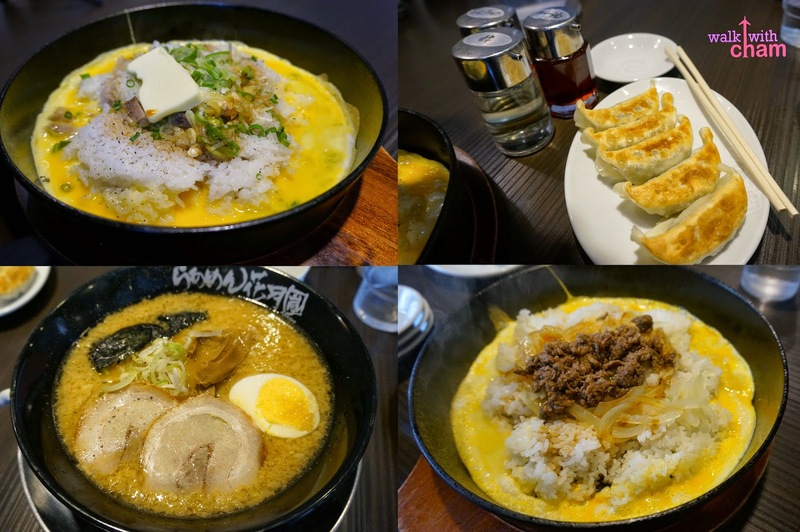 Ippudo offers a number of different ramens so I guess you already know what our orders were. 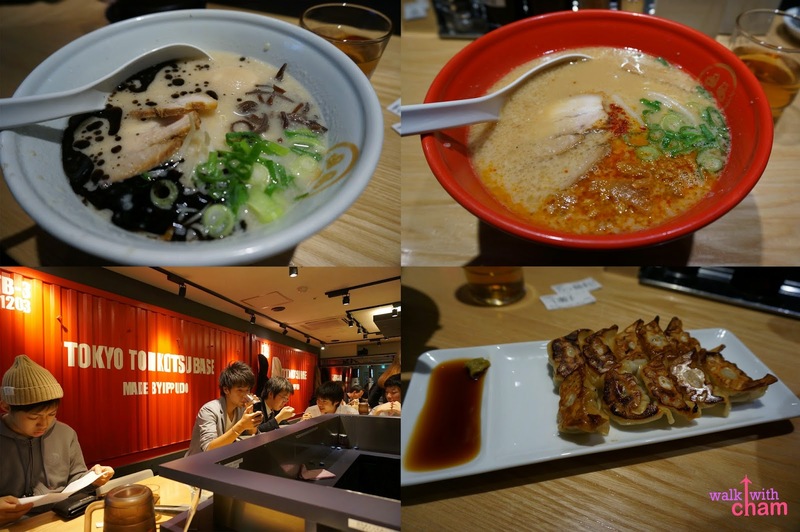 The ramen ranges from Y680-Y940 (P293-P405) and based on all the ramens I've tasted I got to say that their ramen stood out from the rest. 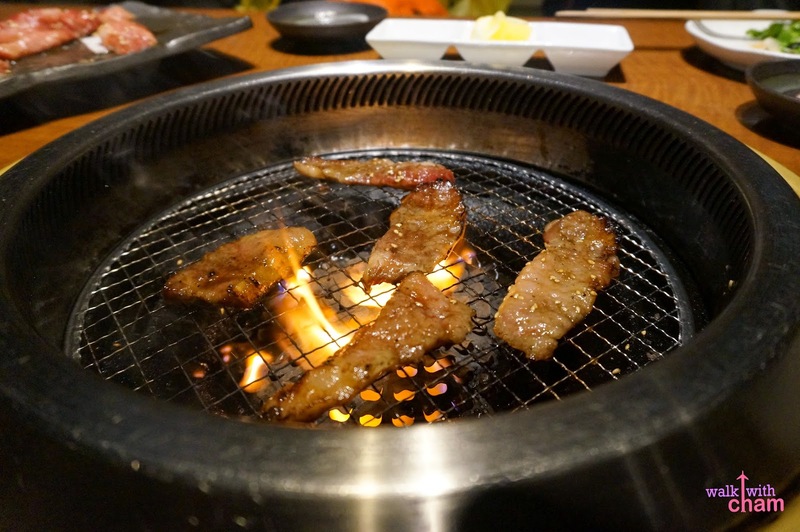 Yakiniku means grilled meat, today the term Yakiniku commonly refers to bite sized meat grilled on a hot flame. 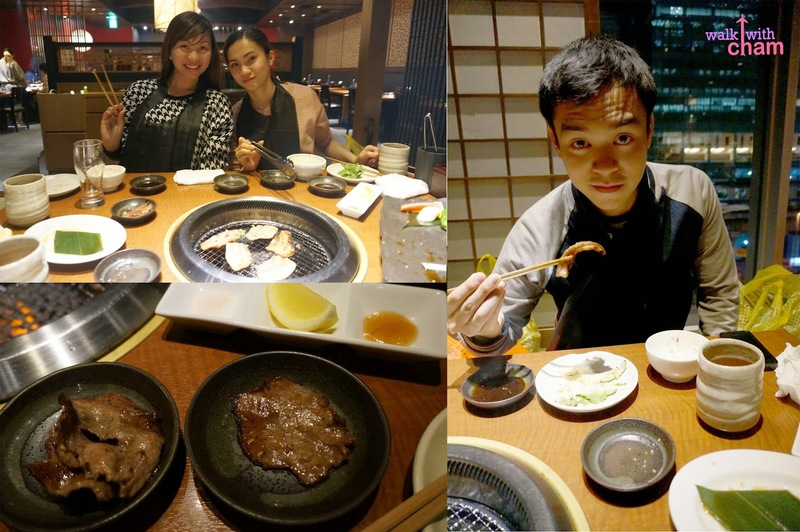 My Twin insisted on treating us at a Yakiniku restaurant when we were in Akihabara, it was their (she and her husband) fave type of restaurant when they go out and they want to eat something fancy. 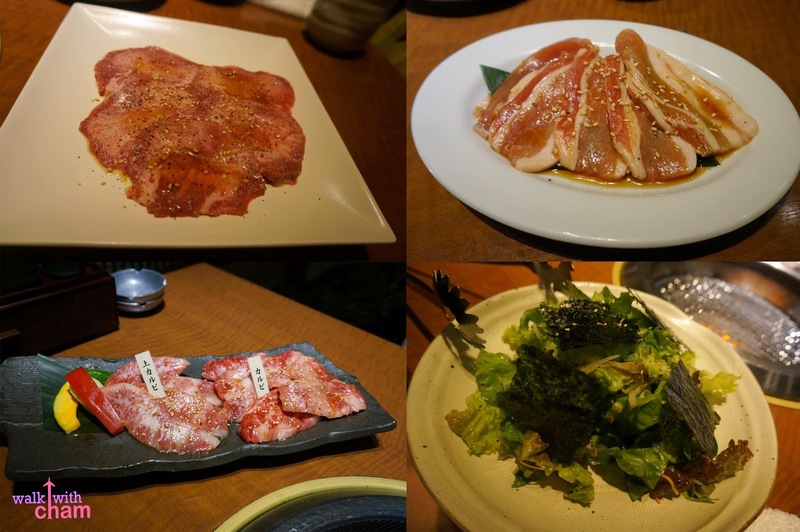 Kanda Enzo, located at the 3rd floor of UDX Building Akihabara serves Yakiniku in a fine ambiance. Everything and I mean EVERYTHING tasted so good! Even the salad & beef tongue which Mike thought he wouldn't eat tasted exquisite. I am really thankful to have my Twin with us, she generously took the bill and paid for it no matter how much we resisted. Grateful for introducing us a new Japanese cuisine. Of course I saved the best for last. 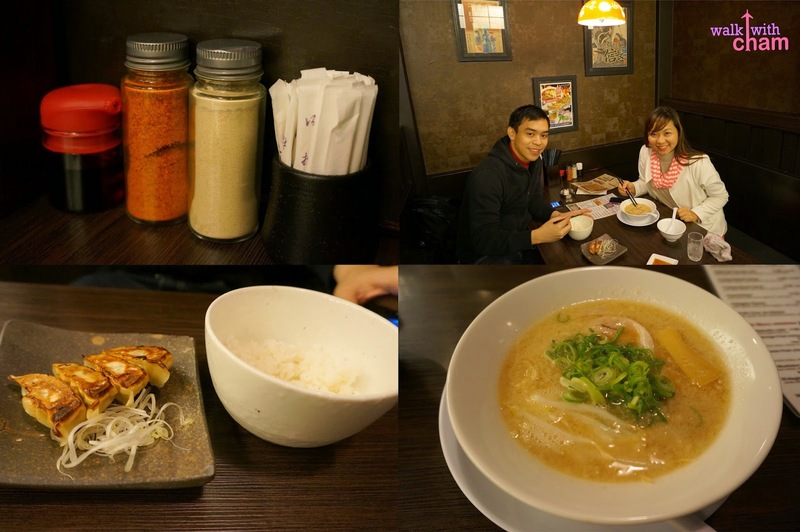 The night before going to Roppongi, Mike researched for a good restaurant to have lunch at. 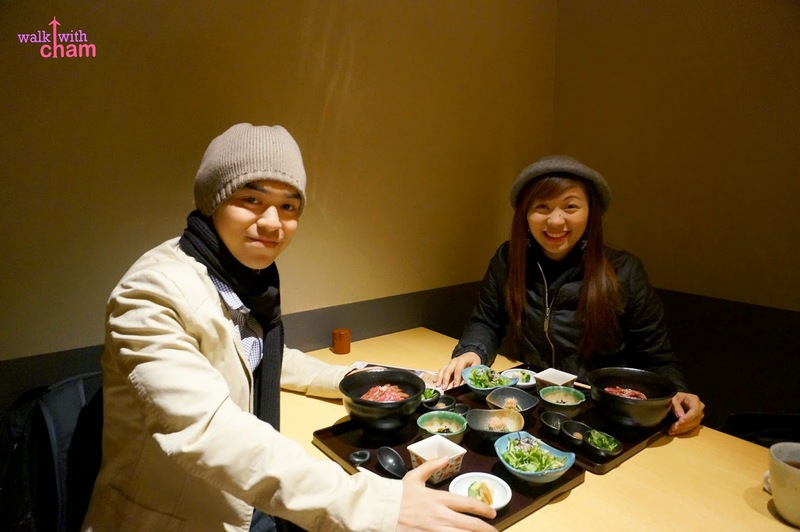 He discovered Matsurokuya, it is a restaurant known to serve an A5-rank Kurogewagyu-beef lunch set at a very reasonable price. The restaurant opens at 11:30 am but you have to go here earlier as it gets full very quick. We arrived in Roppongi on time but got lost and eventually found it. Sadly, we didn't get to be included on the first batch of customers but on a lighter note we were included on the second/last batch, a lot of late customers didn't even had a chance to line up and wait. Mike and I decided if we should wait or not but later on agreed that it was an experience to try the restaurant everyone had been craving about. It was truly an experience I must say as we waited for almost an hour to be seated! Lined up for almost an hour! So when we finally had our turn I took as many shots as I want to document the most coveted dining experience. 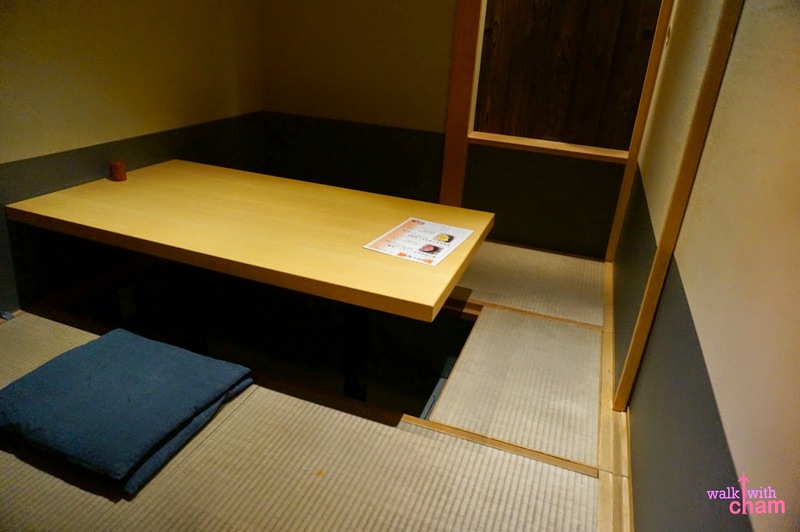 The dining area is in a private room with traditional tatami mats and dining set up. The wait staff then asked for our orders and she recommended to order their best seller- Wagyu Beef lunch set for Y1300 (P560). 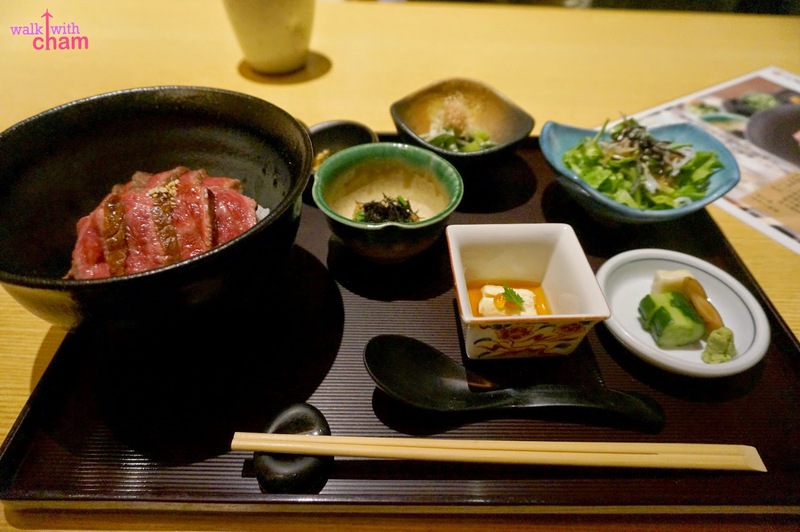 The Wagyu Beef Lunch Set includes a wagyu beef rice bowl and different spices to mix with the bowl such as trefoil, sesame dumpling, hail (Japanese pepper). Also included in the set meal are salad and vegetables. 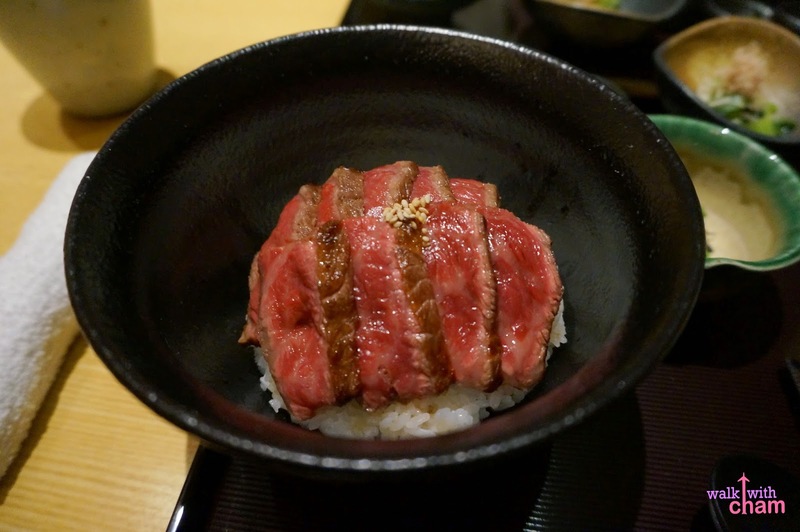 The Wagyu Beef was incredibly off-the-top delicious, the meat was tender and the taste grows on you as you take more bites. And then after a while the wait staff brought some more rice to enjoy with our dish along with a hot dashi that you pour on the bowl to create a new experience in your palate. But that's not all, after we finished our meal they served our dessert of chocolate gelatin with mint on top. Though it was so tiny, we were satisfied by the flavor it gave us. Matsurokuya fell far down the list of perfection! 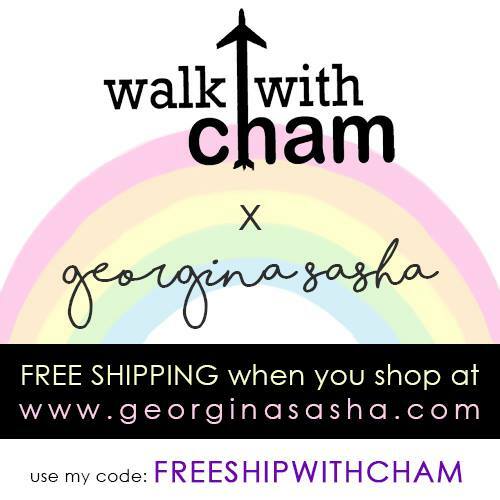 I recommend everyone to try it here. For the price of Y1300 (P560) you get to experience one of the best tasting wagyu ever! 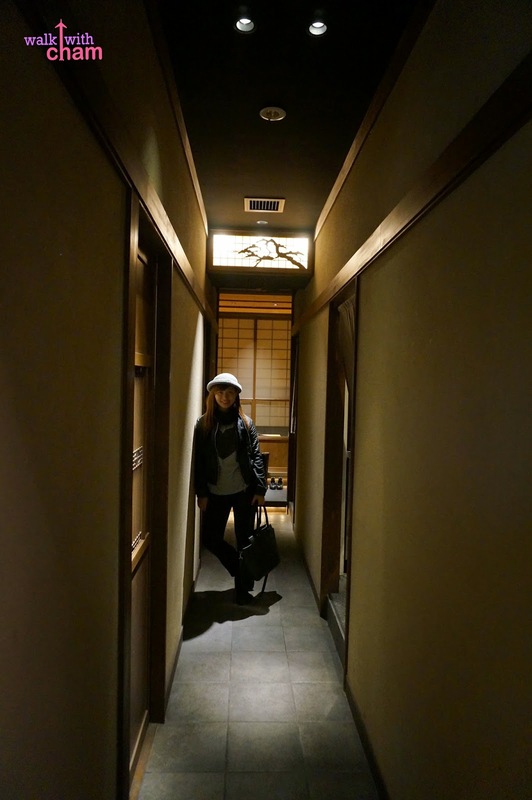 Plus you get to have a feel of the old Japanese ambiance with utterly friendly staff. 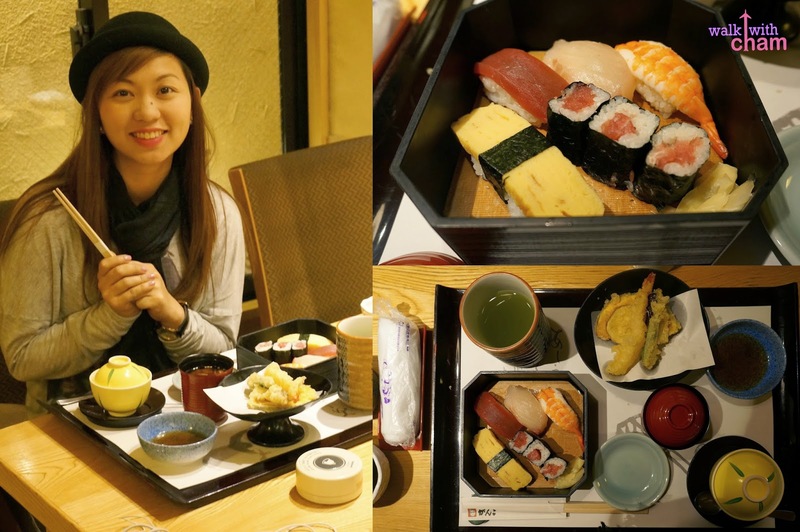 Eating in Japan completed ChaMike's Japan experience. 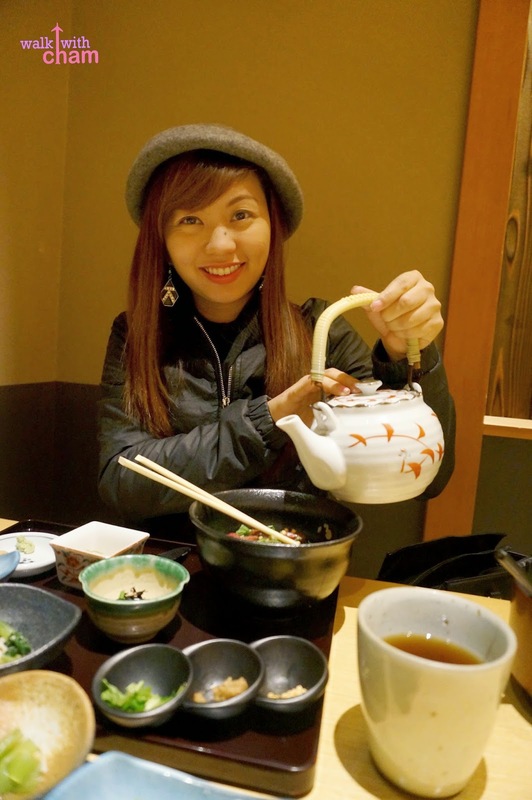 And because of its cuisine I fell inlove with Japan even more.